This perfect blending of a vintage 1918 craftsman bungalow styled home, mixed with upgraded modern times with a heat pump for heating and cooling. 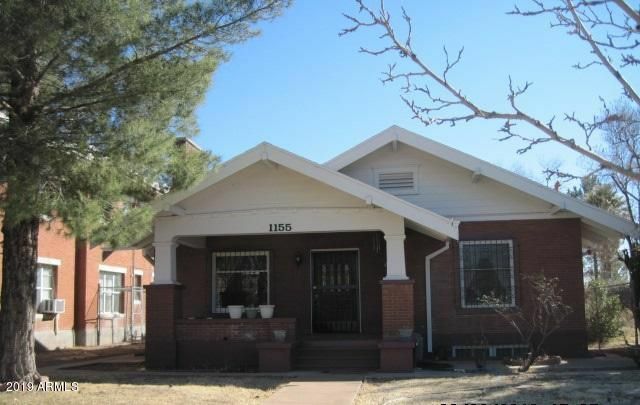 This home is located at 1155 10th St, it is only 4 blocks away from the Douglas Historic District. This home consists of 4 bedrooms and 1.5 baths. A lovely sitting area welcomes you to the openness of the living room with a wood burning fireplace and a charming family room. Hardwood floors with wood molding in main living room and dining area. The Master Bedroom features a bonus room that can be used for a nursery, office or can be turned into an amazing walk-in closet. Fully remodeled hallway bathroom includes jet tub and beautiful ceramic tile surrounding it. Two rooms are located on the lower level with indoor basement for additional storage. Head east on east tenth street toward h avedestination will be on the right1155 east tenth street, douglas, az 85607.